We are blessed with a dairy tradition in Scotland and a wealth of dairy inspired desserts (the one in the main image was from our Blanch and Shock menu). But if the idea of a sensory tasting of 25 ‘traditional’ Scottish dairy desserts would have you banging the door down we would counsel caution. Even the team here, fans of the wild, the unfettered and the non-homogenised found there to be limits to our lactic acid tolerances! The tasting was the culmination of the gastronomic thesis research of Maria Garcia Vilanova, who spent a research stage with us as part of her studies at the Basque Culinary Centre. 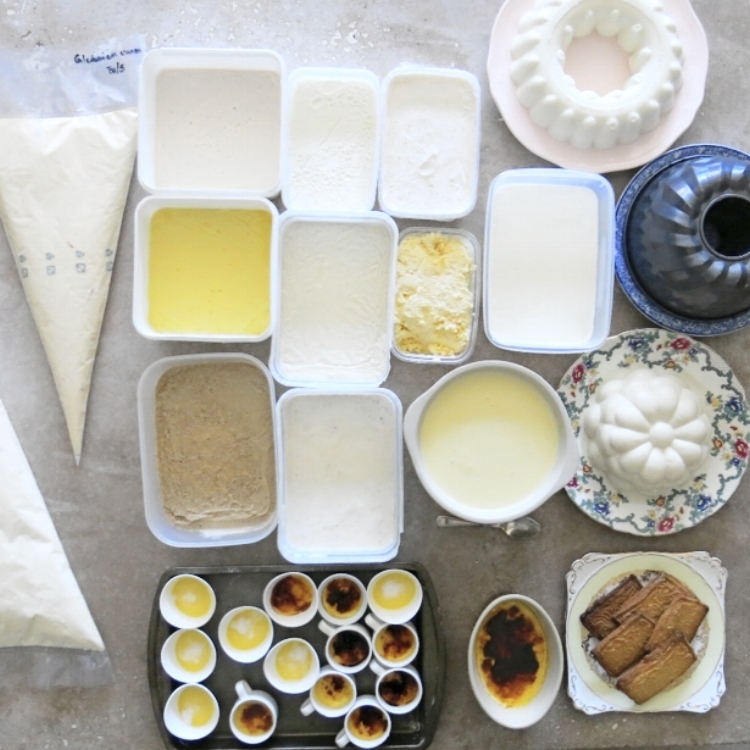 Her exploration of Traditional Dairy Desserts from Scotland is a unique piece of work, and gives context through a literature review alongside a practical exploration of the types of desserts, ingredients and techniques that would have been used with a view to bringing them into a contemporary context. She researched and prepared 25 historical desserts which were then assessed by a panel in taste tests with a view to understanding contemporary tastes. If you have the time, we urge you to read the whole work, which is all the more impressive because it isn’t in Maria’s native language. It gives a succinct summary of the evolution of ‘Scottish’ gastronomy, the cultural, physical and economic landscape as well as a thorough scientific breakdown of anything that could have been done to milk to turn it into a dessert, why it works and what the process is to today. As highlighted in Orlando’s piece for us on the ‘Nordic’ tradition, there’s a thread of Nordic influence that is present in traditional Scottish cuisine, highly evidenced in the use of dairy as desserts in Shetland. The upper-class adoption of French culinary practices had little effect on the highlands and islands so desserts retained much more of their Nordic influence, often using lactic acid fermentation. However, in the taste tests these desserts were the least acceptable to the palate. One that did make the cut was the Hatted kit which Philippa Marsden adapted for her dessert menu with us. Interesting too that some recipes considered to be authentic and traditional, like Cranachan, are relatively contemporary twists on dishes that have fallen out of the vernacular, Fuarag and Stapag. According to Maria’s research, Cranachan only dates from the 1980s! Other desserts should never have disappeared, like the aptly named Edinburgh Fog, a combination of whipped cream, almonds and pastis. The best performers in the taste test were unsurprisingly dishes that had a level of familiarity about them, and a higher level of sweetness and creaminess, which gives us, as chefs and creators a dilemma. It is easy to put things in front of people that fit their expectations of flavour and acceptability, but at times we need to extend those boundaries to avoid a level of homogeneity. We adapted versions of many of the dishes that Maria researched for service, some like the burnt cream and syllabub recipe were more conventional, and others, like the barley puddings and junket provoked a more divisive response from our guests. Maria’s thesis uncovered some unsolved questions; there were no written instructions for using nettles as rennet and she could not get her's to set. The inclusion of butterwort in some recipes for Junket didn't seem to perform a culinary role, but may have been a more rudimental usage, a reminder that the context of the recipe is as important as the instructions. Many of the recipes are included in the annex of the document so feel free to have a go and let us know. Maria comes from Galicia, northwest Spain. Her connection to food started at a very early age in life, her family grows, cooks and values food very much, and this inspired an interest and passion that has evolved ever since. She studied gastronomy at the Basque Culinary Centre where her interest lay beyond cooking in the study of food. She believes her stage here at Edinburgh Food Studio greatly enriched this study. Subsequently she has studied for an MA in Food anthropology, trying to understand food as an holistic vision; and now she is working as a cook with a view to achieving her organic CSA, although she thinks this is a way off. If we know Maria, we know she'll get there!